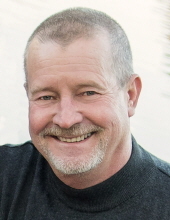 Kenneth R. Daly, born on April 8, 1958, in Spokane, WA, to Ken and Margie Daly, passed away at age 60 on February 3, 2019 at Deaconess Hospital in Spokane, WA surrounded by family. Ken graduated from Central Valley High School in 1977 and worked as a millwright welder, currently for Andritz Hydro Corp. Ken loved spending time with his wife in their RV, flying across the country to be with their children and spoiling his grandchildren with treats. One of his favorite trips was to discover his heritage in Ireland – so proud to be Irish. He took particular joy in wearing his kilt and dressing as a large green leprechaun every St. Paddy’s Day. Ken is survived by his loving wife and best friend, Kelly Owens Daly; his mother, Margie Daly; sister, Linda (Steve) McIntosh; sister-in-law, Pam Daly; children, Jordon (Katie) Daly, Tanner Daly and Savannah Daly; step-children, Paul (Jenne) Hatcher, Ben (Mallory) Hatcher; and grandchildren, Riley and Michael Hatcher. Ken was preceded in death by his father, Ken Daly and brother, Kevin Daly. A celebration of life will be held this Friday, February 8th, at the Valley Real Life Church Otis Campus at 4904 N. Harvard Rd, Otis Orchards, WA at 2:00 pm. In lieu of flowers, donations to Shriners Hospital 911 W 5th Ave., Spokane, WA 99204 would be greatly appreciated. Special thanks go out from the family to the Deaconess Critical Care Unit. To send flowers or a remembrance gift to the family of Kenneth R. Daly, please visit our Tribute Store. "Email Address" would like to share the life celebration of Kenneth R. Daly. Click on the "link" to go to share a favorite memory or leave a condolence message for the family.